AccuWeather reports this year’s ski season in California is on pace to be one of the longest seasons in the past several years due to the abundance of mountain snow that El Niño has delivered. This is a significant turnaround from the past several winters when ski resorts in California were forced to close early due to a lack of snow. Last season, Tahoe Donner Downhill Ski Area closed on Jan. 29. According to Ashely Quadros, the resort’s marketing content coordinator, the mountain typically stays open until the middle of April. Other ski resorts echoed the return to a normal or a longer-than-normal season. “We’ve come off of a couple pretty low snow years and this season has really been a return to a normal snow year for us,” Lauren Burke, public relations manager for Mammoth Mountain Ski Area, said. Mammoth Mountain usually open their slopes around the middle of November and they remains open through Memorial Day weekend. However, this winter is on pace to be an extended season for the ski resort due to the stormy El Niño weather pattern. According to Burke, Mammoth Mountain opened ahead of schedule this season due to early-season storms, allowing skiers and snowboarders to hit the slopes about a week earlier than normal. Additionally, the feet of snow that fell over California’s mountain ranges during the first half of March will help the resort stay open through the entire spring. Not only will ski resorts in California be able to stay open later this season, but they will also have more trails and terrain parks open for skiers and snowboarders. “The terrain that we’re going to have available as we move through the spring is going to be a lot larger [than last year],” Burke said. 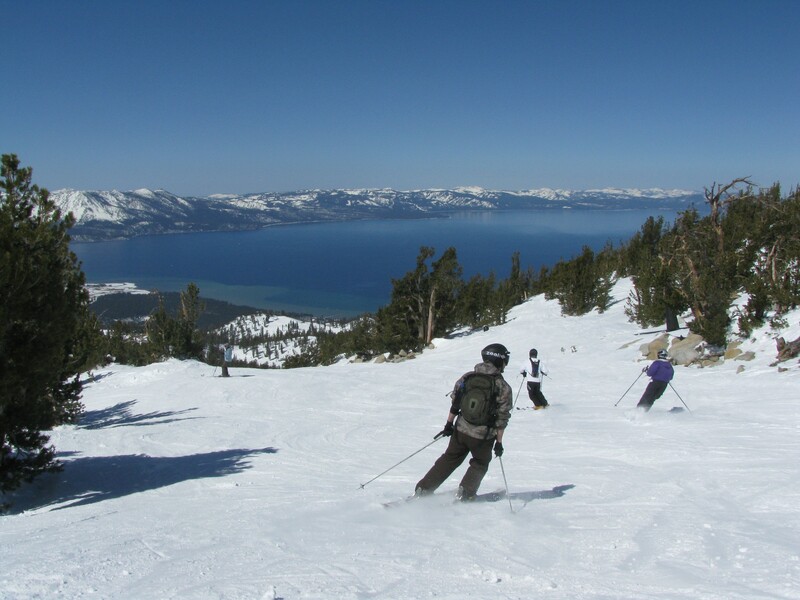 The increased snowfall and extended length of this year’s ski season has been a significant help to the ski industry in California following multiple years with poor conditions. Following the snow drought and shorter season last year, some resorts are touting that winter of 2015-2016 ranks among their top seasons. “This season has been our best yet and we can’t wait to see what else Mother Nature brings us [next] season,” Quadros added. Where will the skiing be best this winter? 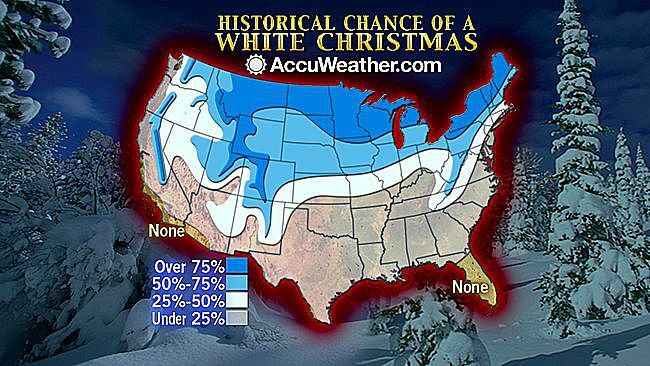 Where will it be brutally cold? According to AccuWeather’s 2015-16 U.S. Winter Forecast, winter will kick off with mild weather in the Northeast and mid-Atlantic as an intensifying El Niño influences the weather pattern across the country. El Niño will drive heavy rain and mountain snow to California, helping to replenish reservoirs but also threatening to cause flooding and mudslides. Meanwhile, a rain deficit will continue to build in the Northwest. After the winter of 2014-2015 brought brutal cold to the northeastern United States, this season is set to be milder overall, but particularly during the early part of the season. Regardless, the Northeast and mid-Atlantic can expect fewer days of subzero temperatures than last year. February of 2015 went down in the record books as the second-coldest February on record for both the region and for eight states individually, including Pennsylvania, New York and all six New England states. Farther west, in the Great Lakes region, a lack of arctic air for much of the early and midwinter will lead to a weak lake-effect season, causing snowfall and precipitation totals to fall below normal. Upstate New York and northern New England are not in the clear, however, as rain events along the coast early in the season can translate to snow in the higher elevations. As one of the strongest El Niños in the last 50 to 60 years continues to develop, it’s likely that heavy rainfall and severe weather will take aim at the Southeast and Gulf Coast. El Niño patterns often result in severe weather outbreaks for this region as bigger, stronger systems are able to take a southern storm track. Florida, in particular, may have a higher risk for tornadoes this season. Southern Georgia and South Carolina are also at a higher risk for severe weather events. Overall, heavy rain will be widespread for the South. As the season progresses, additional rain on an already saturated ground will increase the chances for flooding. “As far as the biggest impacts go, I would look at Shreveport and New Orleans, Louisiana, and Mobile, Alabama. I think those areas are going to get hit with a lot of rain,” Pastelok said. Wintry weather will become active early on in the northern Plains, with the potential for a few snowstorms as early as November and December. As is typical for this region, however, the weather pattern will be a roller coaster, causing wintry weather to back off in the middle of the season and return again just before spring. “There will be a good portion of the middle part of the season where [the weather] doesn’t do a lot, but the bookends can get pretty active,” Pastelok said. At times, temperatures in the north-central Plains could soar into the 50s or even the 60s F for a couple of days as mild weather is pushed out from the Northwest and northern Rockies. In the southern Plains, the building El Niño will dictate an active southern storm track, meaning the region could end up with above-normal precipitation. Below-normal precipitation, in the form of both rain and snow, and above-normal temperatures will define the season across the Northwest and northern and eastern Rockies. 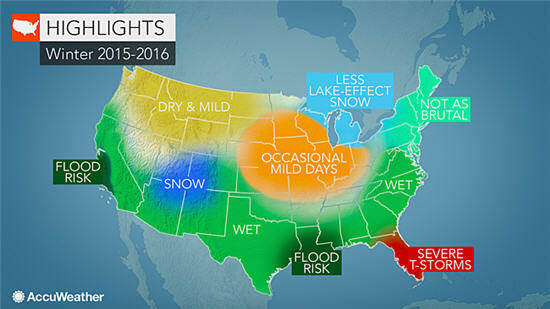 For the season as a whole, the region is likely to end up with snowfall totals much below normal. “Ski areas in the northern Rockies may be missing out on significant fresh snowpack. They’re going to have to make most of their snow at night,” Pastelok said. The dryness across the area could eventually translate to building drought conditions if spring rain is not abundant. 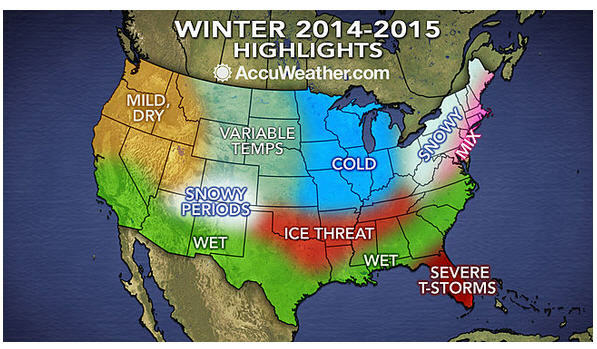 Wet and snowy conditions will frequent the southwestern United States this winter. “Phoenix, Arizona, and Albuquerque, New Mexico, should prepare for significant precipitation this season. “These cities are not going to miss out this year,” according to Pastelok. Across the region, a few precipitation events will occur during November and December, but things will pick up deeper into the season. “January and February will bring more frequent heavy events,” he said. “There’s good news and bad news for California,” according to Pastelok. El Niño will help to set up a pattern of rain and snow for California, which is still dealing with devastating drought conditions and rampant wildfires. Copious amounts of rain from systems over the same area, a theme which occurs often during this type of weather pattern, can lead to problems for California. The state is dealing with more than 9 million acres of wildfire-charred land, more than 2.5 million acres more than the 10-year average. Mudslides and basement flooding may also prove devastating for homeowners. However, there’s a silver lining: The 2015-2016 season may yield triple the amount of snow than that which fell last year in the central and northern mountains. “This is what fills the reservoirs in the spring and early summer,” Pastelok said. Central California will finally experience the feast that follows famine. Pastelok believes his forecast may even be conservative for this area. While the rain and snow will put a dent in the water crisis, it won’t result in the be-all and end-all residents are hoping for. “Will it be enough? I think we need a couple of these kinds of years and I’m not sure we’re going to get that,” Pastelok said. 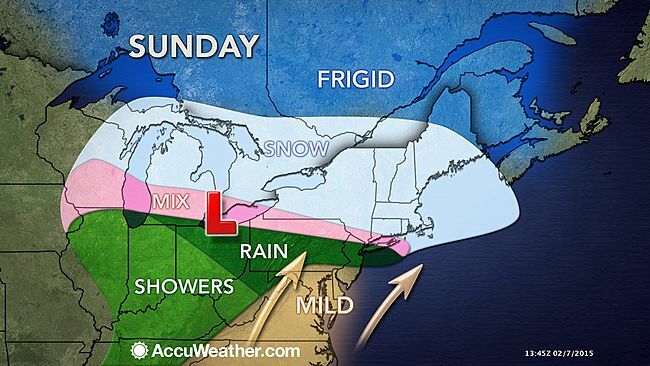 The last in a series of storms bringing snow to part of the Northeast this weekend will bring the heaviest snow and greatest disruptions to travel and daily activities during Monday, February 9, 2015, according to AccuWeather.com. Up until Sunday night, the storms will bring light snow with a few exceptions from northern Minnesota, northern Michigan, New York state and New England. The caboose in the train of storms will end up being the strongest and will bring the heaviest amount of snow by early next week, said Alex Sosnowski, Expert Meteorologist for AccuWeather.com. The steadiest snow from Sunday night into Monday night will fall from New York state to New England. A general 6-12 inches of snow is forecast to fall in this swath, with locally higher amounts. The swath from Boston, northward to Portland, Maine, westward to Concord, New Hampshire; Worcester, Massachusetts; Rutland, Vermont, and Albany, New York, will likely be within the zone that receives the greatest amount of snow from the early week storm and cumulative amount of snow forward from Saturday. Significant snow will fall on the zone from Providence, Rhode Island, to Hartford, Connecticut, and Poughkeepsie, New York. Crews and property owners already struggling with up to several feet of snow on the ground and on some roofs will need to prepare and make room for additional snow. Up to a few inches of snow can reach as far south as northern Pennsylvania, northern New Jersey, the lower Hudson Valley of New York and southern Connecticut. Enough snow, sleet and freezing rain can fall to make roads slippery around New York City, especially where the precipitation occurs during the early morning and evening hours. People heading home from their weekend trips may encounter delays, including those partaking in the excellent skiing conditions the onslaught of storms has produced. Airline and ground travel delays due to snow or some sort of wintry mix are likely from Boston, southward to New York City, and westward to Buffalo, Cleveland, Toronto and Detroit on Monday. The worst travel conditions will be along the New York Thruway and Southern Tier Expressway, the Massachusetts Turnpike, Interstate 84, I-88, I-91, I-93, I-95 from north of New York City to Maine and I-81 in northern Pennsylvania and New York State. Minor travel delays are likely farther to the south on the fringe of the early week storm from Chicago to Pittsburgh and Philadelphia. A few locations in this swath can pick up a coating to an inch of snow and slush. The bulk of the snow will exit the Northeast Monday night, but some snow will linger in part of eastern New England and the Appalachians into Tuesday. Chilly air will expand in the wake of the storm early next week, before a major blast of arctic air sweeps from the Midwest to the East late in the week. 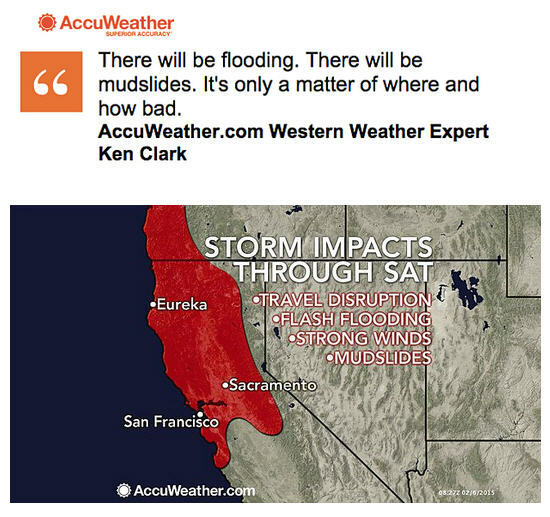 AccuWeather is warning of heavy rain that will inundate coastal Oregon and northern California into early next week, threatening serious flash flooding, mudslides and travel delays and cancellations. A Pineapple Express will help to fuel the heavy rain as the first of two major storms plows into the Pacific coast through Saturday, Meghan Mussoline, Meteorologist, reported. The heaviest rain from the first storm will soak Northern California through Friday night. “A Pineapple Express is a continuous surge of tropical moisture extending from near Hawaii all the way into a West Coast storm,” AccuWeather.com Senior Meteorologist Bernie Rayno said. This pattern can significantly enhance rainfall and threats such as flooding. Recent burn scar areas in California will be especially vulnerable to flooding and debris flows, since rain water cannot penetrate scorched ground. Widespread rainfall amounts of 2-3 inches are expected in western Oregon and northern California, including in the Bay Area. In far northern California, amounts will exceed 6 inches in some communities through Saturday. Lengthy flight delays and cancellations are possible at San Francisco International Airport on Friday due to low clouds and excessive rainfall associated with the storm. 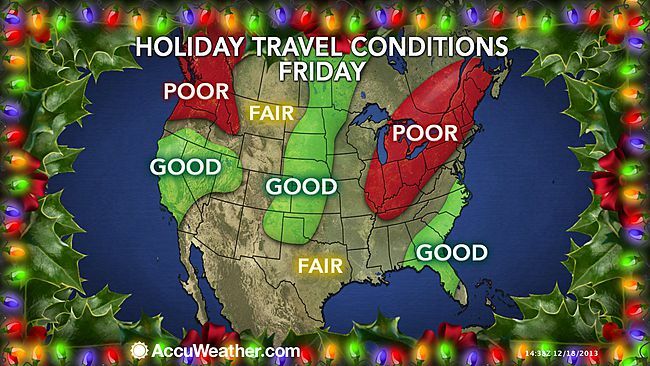 Motorists may face travel problems on the ground as rain mixes with oil buildup on roadways to create slick conditions. During Saturday into Saturday night, the rain will taper to showers. However, runoff will continue to cause small streams to run high. A second storm will arrive along the West Coast Sunday into Monday, unleashing another round of heavy rain and most likely another dose of flash flooding, mudslides and travel disruptions. The rounds of rain follow after an extremely dry January for many locations. “This is the first significant rain [for Northern California] since the middle of December,” Clark said. January 2015 went down in the record books as the driest January on record for San Francisco with no rain recorded. Meanwhile, mountain snowpack is an important resource for filling reservoirs and water supply for drought-stricken California. It is crucial to look at snowpack when analyzing the potential impact of storms on the ongoing drought. However, mountain snow is not likely with the upcoming storms, Clark said. The best locations for viewing the Leonid Meteor Shower in the United States will be in the Northeast and across the Southwest, Nov. 16-18. 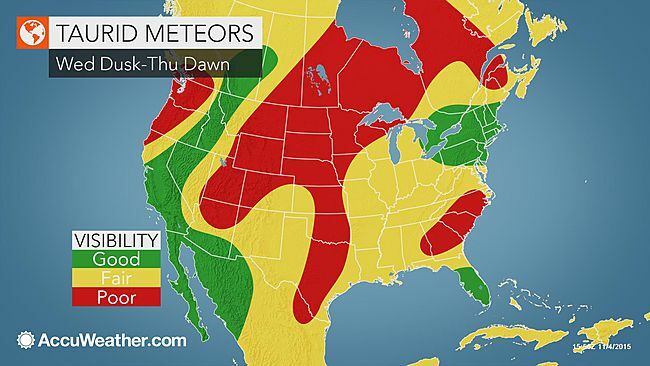 AccuWeather.com’s Jillian MacMath reports the Leonid meteor shower, which began in early November, will peak Nov. 16-18, 2013, though it may be tough to see due to another celestial display. As the shower hits its peak this weekend, the moon will near its full phase, making the sky particularly bright. “This will be a major obstacle to viewing this sometimes brilliant meteor shower,” AccuWeather.com Astronomy Expert Mark Paquette said. Despite the moonlight, the meteors will pick up steam after midnight and display the greatest numbers just before dawn on the 17th and 18th. The best locations for viewing the show in the United States will be in the Northeast and across the Southwest. 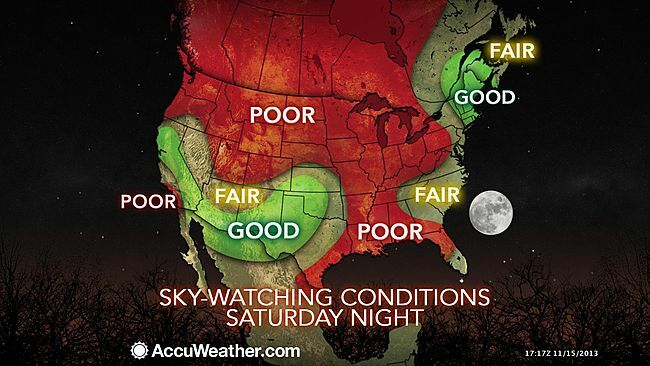 Likewise, comet ISON will be more visible than usual this weekend, especially on Nov. 17. This comet is new to our solar system and has undergone significant brightening in the last few days making it visible to the naked eye, MacMath reports. However, despite its visibility now, it will near the sun next and it could be destroyed, according to Paquette. If the comet survives, it could again be visible as it moves away from the sun in the weeks after Thanksgiving. Due its potential destruction, the ideal time to view this comet is this weekend. It can be seen near the constellation Virgo just before dawn on Nov. 17. The brighter conditions of the comet will not yet make it visible to the naked eye, but it can be seen with a telescope or binoculars. On November 17 and 18, it will pass by the star Spica, improving its viewing conditions for areas with clear skies.